Gratuity is a monetary / loyalty benefit given by an organization to its employees at the time of leaving the organization. 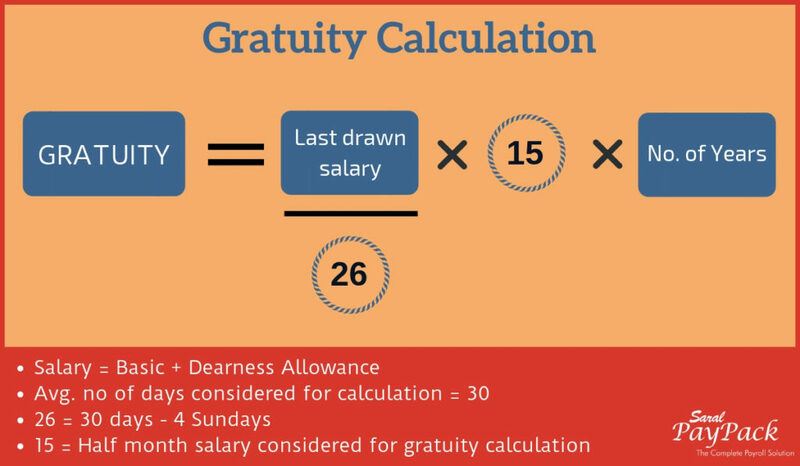 As per the gratuity law, it is applicable for people who have worked in the same organization for 5 or more years. While it is usually paid at the time of retirement, it can also be paid before if certain conditions are met. This benefit is made mandatory by Payment of Gratuity Act, 1972 in recognition of employee’s years of service in the organization. In general, Gratuity is applicable to any organization which employs ten or more people or has employed (10 or more people) at any given time in the preceding twelve months. An employee retires after completing 5 years of continuous service with the same organization. If an employee resigns after 5 years of working with the same organization. If an employee is being transferred overseas on an assignment, then he / she is eligible for gratuity. An employee who passes away or suffers disability due to illness or an accident. The ratio 15 / 26 represents 15 days out of 26 working days in a month i.e., An average of 30 days reduced by 4 Sundays is considered for calculation. Last drawn salary = Basic Salary + Dearness Allowance i.e., Basic + DA. Here we do not consider gross salary or net salary. So, years of service are rounded down to the nearest full year. For e.g., If the employee has a total service of 20 years, 10 months and 25 days, then you will receive the gratuity for 21 years. If an employee has a total service of 20 years, 1 month and 25 days, no. of years will be 20 years. The amount of gratuity cannot exceed Rs. 20 lakhs. If it exceeds that amount, it will come under as ex-gratia. Yes. Gratuity is taxable but only if it exceeds an amount of Rs. 20 Lakh. The taxable amount will be added to the total income under “others” category and tax will be calculated on income tax slab. For e.g., If a person gets the gratuity of Rs. 15,25,742, then this amount is not taxable. If a person gets the gratuity of Rs. 25,25,742, then, exemption will only be for Rs. 20 and Rs. 5,25,742 is taxable. This ends our post. Also, if you have any doubts or queries kindly drop them in the comment section below. I have completed my 4yrs 11months 10days service in the same organization. Am I eligible for Gratuity. If employee resign from onsite with last drawn onsite ($/£) with payroll transferred out of india, what is last drawn salary ?